Between Page and Screen explores the place of books as objects in an era of increasingly screen-based reading. The pages of this artist's book contain no text—only abstract geometric patterns and a web address leading to this site, where the book may be read using any browser and a webcam. The poems that appear, a series of letters written by two lovers struggling to map the boundaries of their relationship, do not exist on either page or screen, but in the augmented space between them opened up by the reader. 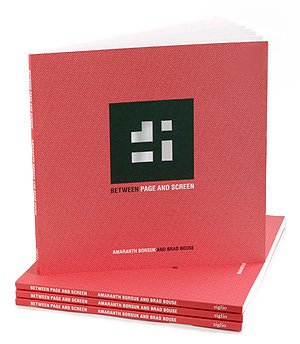 Between Page and Screen is in its third edition from SpringGun Press and is available from SpringGun and Amazon. Read more about it in Salon, Wired, Brainpickings, Mashable, Huffington Post, Daily Beast, American Scientist, and The Economist. Amaranth Borsuk is the author of Pomegranate Eater (Kore Press, 2016), a collection of poems; As We Know (Subito, 2014), a book-length erasure collaboration with Andy Fitch; Handiwork (Slope Editions, 2012), selected by Paul Hoover for the 2011 Slope Editions Book Prize; and Tonal Saw (The Song Cave, 2010), a chapbook. Abra (1913 Press, 2016), a book of mutating poems created with Kate Durbin, received an NEA-sponsored Expanded Artists’ Books grant from the Center for Book and Paper Arts at Columbia College Chicago and was recently released as a limited-edition book with a free iPad / iPhone app created by Ian Hatcher." Borsuk's other digital collaborations include The Deletionist , an erasure bookmarklet created with Nick Montfort and Jesper Juul; and Whispering Galleries , a site-specific LeapMotion interactive textwork for the New Haven Free Public Library. Borsuk received her Ph.D. in Literature and Creative Writing at the University of Southern California and served as a Mellon Postdoctoral Fellow in the Humanities at MIT before joining the faculty of the University of Washington, Bothell, where she is currently an Assistant Professor in the School of Interdisciplinary Arts and Sciences. 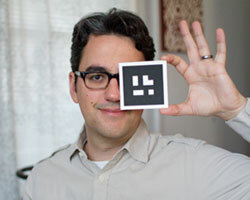 Brad Bouse is a developer whose work focuses on the intersection of art and technology. He is the co-founder of Lightboard. He frequently presents about art and code, including this presentation about the Usefulness of Uselessness at JSConf.EU in Berlin. 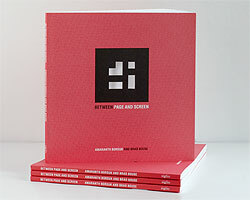 Between Page and Screen is published by SpringGun Press. Buy the book from SpringGun or Amazon. 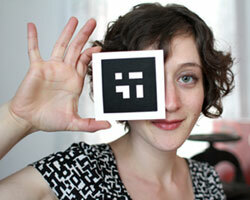 Between Page and Screen uses the FLARToolkit to project animations in an augmented-reality. The application also uses the Robot Legs framework, Papervision 3D engine, BetweenAS3 animation engine, and Jiglib physics engine. The source code is available here. 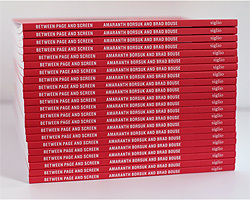 The third printing of Between Page and Screen is now available in bookstores and online. Buy from SpringGun, our publishers.